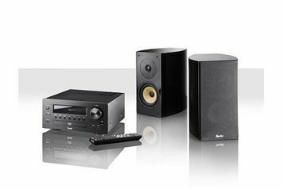 Teufel expands electronics range with Impaq 40 mini system | What Hi-Fi? The £304 Impaq 40 is a stereo AM/FM receiver with CD player and USB connectivity. Power is a claimed 2 x 25W, a pair of stereo speakers comes as standard and the RDS-equipped tuner has 40 presets. Digital audio files can be played through the system using the USB socket, and there's a separate subwoofer connection should you need it. "Its compact size enables the system to be placed anywhere, so whether you live in a rambling mansion or studio apartment, it will sit neatly on a shelf, cabinet or worktop," says Teufel. The Impaq 40 is available now from Teufel's website. Check out our review of the Teufel Ultima 60 floorstanding speakers in the December 2009 issue of What Hi-Fi? Sound and Vision, on sale November 13th.